Hormone replacement therapy (HRT) brings many benefits but also risks to women who take it to deal with the signs and symptoms of menopause. A recent study shows there is another risk that should be added to the other risks of HRT – kidney stones. 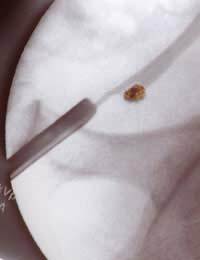 Kidney stones happen when hard calcium crystals or other substances in urine separate from the liquid. These crystals are normally tiny but can grow from something smaller than a pea to the size of a golf ball. For some people, they will eventually ‘pass’ the stone through their urine but others will require treatment to break up the stone. Even where a person naturally passes the stone, a tiny one can still be excruciatingly painful. For the experiment, more than twenty-four thousand postmenopausal women were participants. They took either hormone pills or placebo pills – “dummy” pills that don’t contain the hormones being tested. Results indicated that the women taking the hormone pills were just over twenty percent more likely to suffer from kidney stones over an approximately five-year period. This would mean that if ten thousand women took the hormones after menopause, five of them would potentially develop kidney stones compared to if they had not taken the hormones. The study itself didn’t start out to measure the effect of hormones on kidney stones. Instead, it was part of a long-term women’s health study that aimed to see how the hormones would affect many different aspects of health. Kidney stones were just one part of the study where women were asked throughout the study if they had suffered from kidney stones. Perhaps surprisingly, naturally occurring oestrogen was previously believed to offer protection against kidney stones. Some scientists had originally proposed that oestrogen pills would do the same although the results show the exact opposite. Researchers don’t know exactly why the women taking hormones are more susceptible to kidney stones. They suspect it could be that uric acid levels in a woman’s urine go up when they take oestrogen. In turn, this could play a role in the formation of kidney stones. A non-government study, however, did not find this same risk. Results in this study showed that there was no difference in kidney stone risk for women taking hormone pills. It’s yet another confusing outcome for postmenopausal women but we will hopefully have more conclusive studies in the future. As an average, approximately six percent of postmenopausal women go on to suffer from kidney stones. This new study suggests that if a woman wants to take HRT, she should carefully think about the benefits but also the risks, including the risk of kidney stones. This risk adds to other known risk of HRT, such as a link to certain cancers and stroke. Doctors now typically recommend that if a woman chooses to take HRT, she take the lowest dose needed to relieve symptoms, and for the shortest time possible. Most researchers don’t expect the study on kidney stones will change this established approach. It is, however, important in particular for women who have already suffered from kidney stones and have a higher risk of recurrence. You should talk to your doctor about whether HRT is appropriate for your symptoms. If not, there are many alternatives that can help reduce your menopause symptoms.